Welcome to the CJMC informational website. The CJMC is a National club with International connections, and is dedicated to the celebration, preservation, and having fun with the early Japanese manufactured motorcycle. "If you like it, it must be a classic!" Parts, information, contacts, and friends are just a few of the reasons for >>>> joining the CJMC (or the pdf version) here <<<<. If you are interested in Japanese motorcycles then this is the club you want to join. CLUB ATMOSPHERE The club is here for your enjoyment. It is here to help you have fun with your classic Japanese motorcycle. The club and its members are low key, no pressure, and strive to have a good time! We support rides, meets, shows, swaps, and can help you find parts and support other Classic Japanese Motorcycle activities in your area. With thousands of cumulative years of technical motorcycle experience, our club membership can help you find parts to complete a project or locate a shop manual, book, or even a new project to buy or sell. If you are looking for classic Japanese motorcycles or just to make new friends with a common interest, then the CJMC is the place to be. This is a network for Japanese motorcycles, so, if that is your interest, then please consider joining us. This club has its roots and original core 'Membership' based in California's San Francisco Bay and Central areas, yet we have membership throughout the country and the world. Please check out our schedule of events on the >>> calendar <<< page and join us for our next event. CLUB STRUCTURE There is no governing body, we have a few directors to keep things in order but it is the strong participatory membership who runs this club and makes it all happen! NEWSLETTER & e-MAIL GROUP The newsletter and our e-mail group keeps you in contact with what is happening both in the world of old Japanese motorcycles and in the CJMC. From getting parts for your '58 Honda Dream to a shop manual for your Kawasaki GPz 1100, the newsletter want ad section is the place to look. Free ads for members and non-members mean there is a steady stream of interesting stuff. 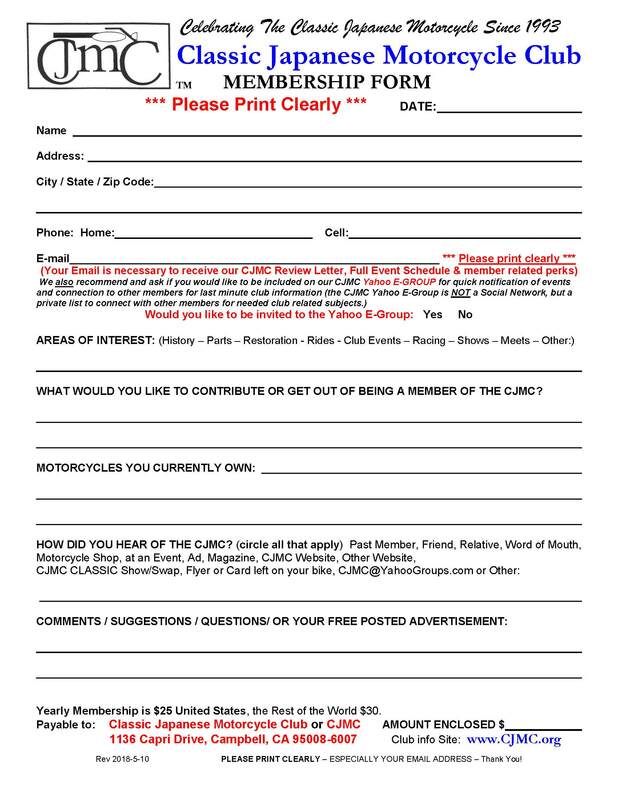 The newsletter holds articles on CJMC activities, supplies Tech-Tips of knowledge toward your bike and riding needs, supplies a detailed calendar of our club's events and other entertaining subject matter pertaining to having fun with your classic Japanese motorcycle. MEMBERSHIP Annual dues are $25.00 for the United States and Canada, $30.00 for the rest of the world. Membership is handled on a yearly basis from the month you join. Complete the >>> membership application <<< and mail the completed application in. "FOR SALE" or "WANTED" ITEMS In addition to our newsletter, our club does have an online "For Sale" or "Wanted" section through our CJMC Yahoo user group of over 500+ members. If you want to sell classic/vintage related items or need a special part/bike, or just need or want information, please e-mail Neil Rodrigues at neil_rodrigues@yahoo.com and he will be happy to add you to our user group or help post your needs and wants.